I'm sure you have all gathered that I love paintings and original oil paintings are by far my passion and love. However, they can be really expensive and that doesn't really fit my budget. Our previous home was much larger and had extremely tall vaulted ceilings, so HUGE art was necessary. I found a place that had these Starving Artists Sales quite often and always made sure to visit each sale. 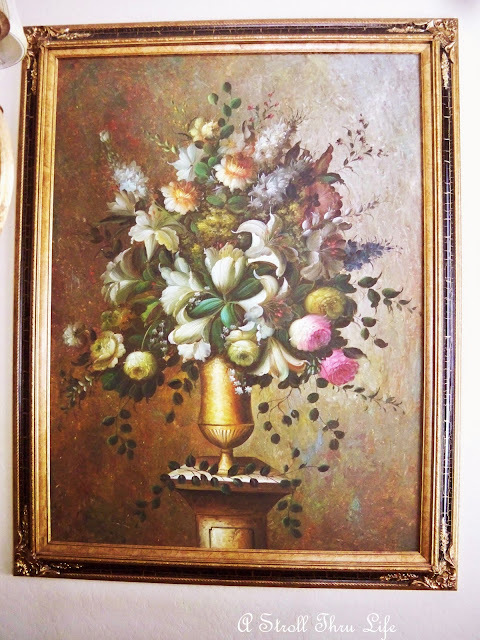 I found some of the most wonderful things at the most reasonable prices and with fabulous frames. This one hangs in our dining area now, it is huge it measures 3ft. x 4 ft. The colors and the detail in the painting are stunning. I think most of these this size were around $100 frame and all. 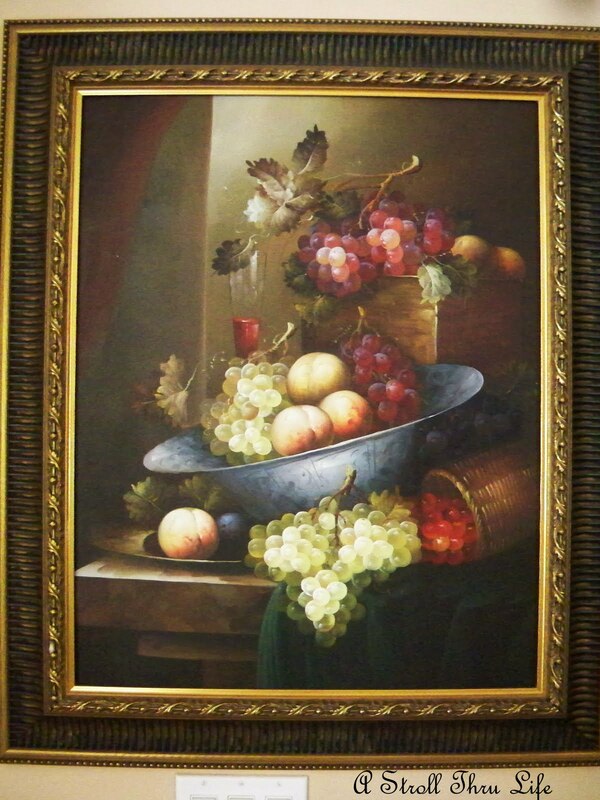 I couldn't capture all the brush strokes of the oil in the picture, but the detail is exquisite. 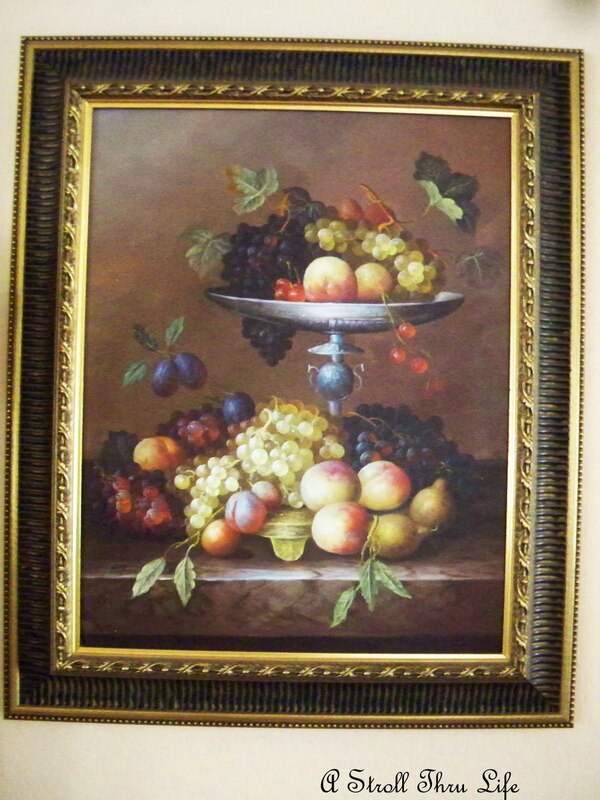 I purchased 2 still-life paintings for our previous dining room. Again the detail on each of them is outstanding. These now hang on either side of my china cabinet. Love this precious little girl. She is so pretty and the colors are so lovely. The details of her face are so realestic. 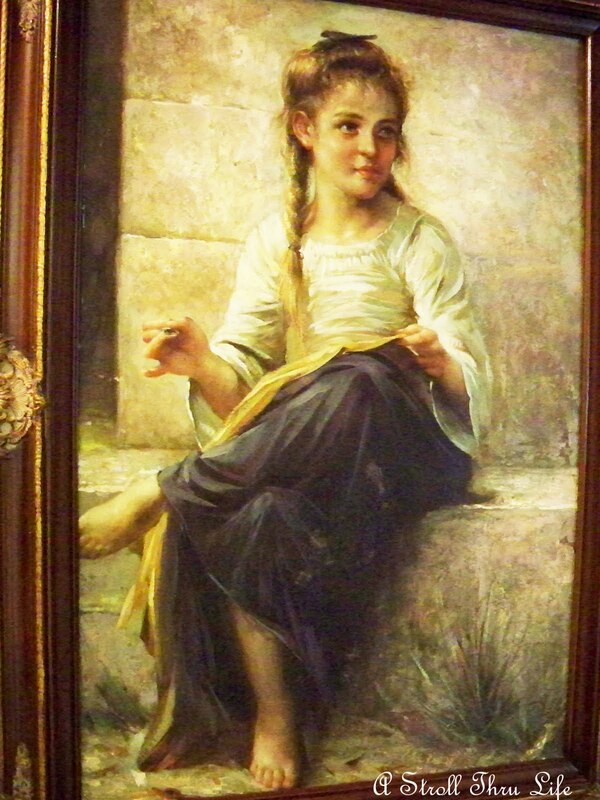 She's hanging in the hall. 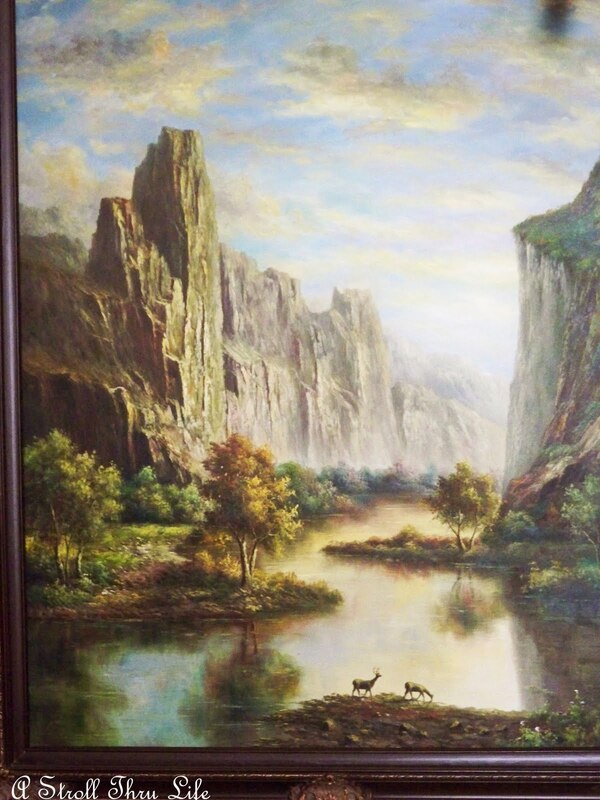 The light shining through the canyon in this painting is beautiful. I had this one hanging in my DH office previously, it is now in our bedroom because that's the only room where I have a wall big enough for it. This Hunt Scene is so detailed. You feel like you can see the horses muscles rippling as they ride. This was in the Den of the previous house and now is in the guestroom. So, if you see one of the Starving Artist Sales being advertised, go take a look. You will find some fabulous art and at the most reasonable prices. Hope you all are having a super weekend. Oh, I especially like the first one, Marty! These are really pretty, Marty, I love the still lifes! Marty, my favorite one is of the little girl! Absolutely beautiful artwork. Thanks for sharing. Love the art. I found you blog hopping and am so glad I did. These peices are truly special. I love the little girl. They'll all in the old masters style that I love but can't do. That's true talent. Thank you for posting those beautiful paintings Marty! 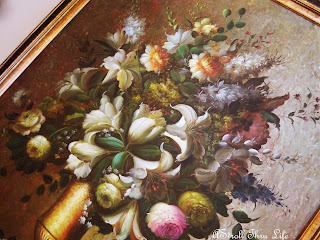 It was like a trip to the art gallery to see "Old Master"-type paintings. Yours look just as great as ones IN an art gallery. My favorite is the girl. I am going to mention you in a blog post today I am doing about how being in your "parties" has helped my little "newbie" blog have more page views. thank you for sharing all the beautiful paintings Marty ! I enjoy all of your oils every time you feature them - big or small! But I do really love the girl in your hall. She's beautiful. They are all so beautiful! My favorite one is the little girl. She seems to speak to me! I used to see these "starving artist" sales advertised all the time when we lived near a bigger city, but we never have them where I live now. I missed out since I never purchased anything from them. If I ever am fortunate enough to happen upon one again, you can bet I'll be checking it out!!! I have heard about them, but have never gone to one. I don't have a painting in my house Marty...what is the deal with that??? I love the way you use art in your home. We have a house full of art also, I can't stand bare walls. Most of our art is from local artists or artists we've met. There aren't any "Starving Artist" sales in this area, but we used to check them out when we lived near Edmonton, Alberta. I can't believe that painting was only $100 frame and all! I have only a few pieces of original art, and I'm sure I paid more than $100 just for the frame. (That's why I have only a few pieces!) These are just lovely. I've never checked out one of the Starving Artists' sales, but I will now! The paintings are beautiful. I particular like the young lady. She is just stunning. 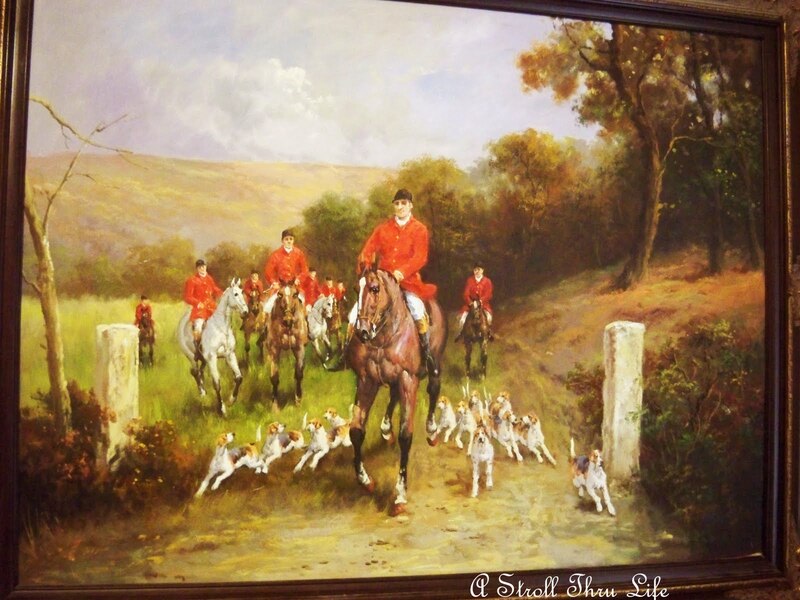 I love the Hunt Scene painting. I have a hunt print that probably cost about that 20 years ago. You find such great stuff!! Lovely, Marty. I especially like the hunt scene. I love a beautiful ol painting. Love the hunt scene. Have great weekend. Thank you for popping over to my blog! Hi Marty, They are all beautiful paintings and I especially love the one of the sweet young girl. I have always wondered about these sales. I will definitely go the next time I see one advertised. Lovely pieces of art, dear friend! You have such an eye for quality work! I agree, the frames are extremely expensive, as "Mr. Ed" and I are working on a project that has come to a standstill due to the need to purchase new frames! Thank you for sharing your beautiful pieces of art! They are all so beautiful Marty! My face is of the girl. They are all so beautiful! Marty, You have a real eye for art. I would love to visit the Starving Artist Sales with some of my girlfriends. When and where are they held? We are in the Rim Country. Come up to get cooled off!